Great Shelford library has launched its own loyalty scheme. There are three candidates for two seats on the Parish Council, with elections taking place on May 2. Read an update of how the work on the Rec will benefit the Shelford Feast. A new coffee shop is opening in Great Shelford. A proposal for a Mr Taco food van on the Memorial Hall car park on Fridays lunchtimes has been given the go ahead. Read about the other actions and decisions at the February Parish Council meeting. Jewellery and gold stolen in the £14m Hatton Garden raid were found following a search of a Great Shelford house . The Co-op was broken into overnight March 12/13. Its the second break-in this year. On January 24, cigarettes were stolen in another burglary at the High Street store. More than 1,000 people a month are not turning up to appointments at the Granta Medical Practice, which includes the Shelford Medical Practice. Volunteers are need to help run Arthur's Shed at the Arthur Rank Hospice. Volunteers are needed to help with a new community cafe. Part of the Memorial Hall car park will be closed in March and April from Feb 25 to allow for installation of new water drainage and electric services. Tesco's is being asked to install a cash machine following the closure of Great Shelford's last cash machine at Barclays Bank. There were three burglaries in Great Shelford in January. Pimp My Fish, a new food truck, launched in Great Shelford in January. Two new yoga sessions are starting in the Shelfords in February. The first class will be a a complementary taster session. The reasons behind a range of changes at the Shelford Medical Practice have been set out. A special shed with a difference has been launched at the Arthur Rank Hospice. The Shelford Feast raised £11,800 for local good causes in July it has been announced. The ATM at Barclays Bank in Great Shelford was stolen by ram raiders using a JCB on October 29. Photo; Pete Bassett. Great Shelford's Highways committee meeting includes potholes, engines being switched off when waiting for trains in the village and an update on the Hinton Way crossing at its November meeting. (external lnk). Shelford Deli closed its deli shop in October, and reopened several days later with a new cafe-bistro. 55% of local people who took part in a special poll about proposals for a new Memorial Hall and underground car park said they were in favour of the development. Meanwhile proposals for a new Memorial hall with an underground car park have taken a step forward. Zara Indian restaurant raised £1,200 through a fundraising evening to help victims of the summer floods in Kerala on October 15 involving West End actress Heather Craney. Barkers Butchers have created a special sausage to celebrate their 175th anniversary which includes Pork, herbs pepper and apple. Double and single yellow line changes have been proposed by the Parish Council for nine roads in Great Shelford. A new 20 MPH zone is now in place in Mingle Lane and other parts of Stapleford. See a map of the Stapleford roads affected by the new 20mph zone. (Photo; John Wakefield). Did you know Barkers Butchers are happy if you take a Tupperware container in when buying ham, sausages and cheese? The Parish Council held a special meeting after a number of incidents on the Recreation Ground in Woollards Lane. There have been two daytime burglaries in Great Shelford. City Care Services in Great Shelford are looking for local people that are interested in becoming a Carer or domestic cleaner. Call them on 01223 842100. Full training given but transport essential. Proposals for the 7a bus to no longer pick passengers up in Great Shelford from July 30 have been changed after being highlighted on Great Shelford Online. The Your Hospice Lottery for Arthur Rank Hospice Charity may soon have helped raise £1 million for the Hospice. The Playscape proposals for a new playground at the Rec have been given planning permission. The long awaited yellow parking restriction lines were finally installed in Hinton Way and Mingle Lane this week. Malcolm Watson is the new Vice Chair of Great Shelford Parish Council. A meeting is being held to discuss the need for and possible provision of more affordable housing in Great Shelford on June 20. Free wifi is now available near the Memorial Hall, called GSFreewifi. The password is GreatShelford. It is expected to be expanded over the next few months. A 10 year-old girl spotted Nazi graffiti on her way home from school. Her mum described the incident in Buristead Road as "shameful and hurtful unacceptable behaviour. " Could an underground car park be built in Great Shelford? An attempted house burglary in Great Shelford is one of six break-ins in South Cambridgeshire where police say the homes were targeted. Christopher Grey will be the new Headteacher at Great and Little Shelford School from September 2018 following the departure of current head Alison Evans. He was Interim Head of School at St Felix RC Primary School in Haverhill. As part of plans to improve journeys times and congestion along the A1307 and A1301, the Greater Cambridge Partnership is looking to hear the views of residents in Great Shelford and Stapleford . Great Shelford to the Cambridge Biomedical Campus. Almost 150 people who attended a meeting about the future of the Shelford Medical Practice were told that the proposed merger will retain, maintain & improve their presence and service in Great Shelford. Lloyds Bank in Great Shelford closed in 2018. Great Shelford's business park has been sold for almost £10 million (external link). The unusual sun captured over the Shelfords by Ruth Shah on October 16. Fungi photographed at Great Shelford rec. A defibrillator has been installed outside of Tesco's (external link). A 180 home development in Great Shelford and Stapleford including a "care village" is being marketed online. The Zara Indian restaurant has a new website. (external link). McColl's news agents on Woollards Lane closed on July 14 2017. The new Great Shelford Post Office was formally opened by MP Heidi Allen on March 24. Pictured (left to right are: Mike Nettleton, Chair, Great Shelford parish Council Kash and his wife Jayshri who run the new Post Office, MP Heidi Allen and District Councillor Charles Nightingale. Meanwhile its emerged another village shop is closing. TV celebrity Gloria Hunniford formally opened the Cambridge Care Home in Great Shelford on March 25. She is pictured with home Founding Director Helena Jeffery and MD Rob Jeffery. 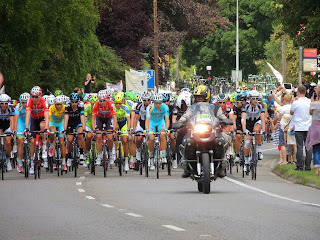 The Tour de France came to Great Shelford on July 7 2014. A former Arsenal star has moved into Great Shelford. This community website for Great Shelford includes details about the Great Shelford medical centre aka the Great Shelford doctors, the Great Shelford rugby club, the new Great Shelford post office, Great Shelford FC, Great Shelford football club, Great Shelford school, the Great Shelford dentist, Great and Little Shelford primary school, Great Shelford library, the Great Shelford calendar, Great Shelford Parish Council and details about Great Shelford history as well as Restaurants in Great Shelford including the best places to eat in Great Shelford including the Indian restaurant Zara, and the Chinese restaurant Forum House, Great Shelford estate agents including Haart, Tucker Gardner , Redmayne, and Sharman Quinney, Great Shelford businesses including , Great Shelford deli, Davies Solicitors, Pipedream plumbing, Great Shelford dental surgery, Shops in Great Shelford including Great Shelford deli, Barkers the butchers, Hair Solutions Great Shelford and Great Shelford Post Office as well as Pubs in Great Shelford including the Plough and Square and Compasses, builders in Great Shelford, plumbers in Great Shelford, Great Shelford churches including Great Shelford St Mary's Church, Great Shelford Free Church and Great Shelford community groups including Great Shelford Tennis Club, and Great Shelford WI. The Great Shelford website Great Shelford Online also includes details about Great Shelford events including the Great Shelford Feast, Great Shelford camping, bed and breakfast and hotel information. There is also a page on Great Shelford community groups, Great Shelford planning and the Great Shelford village plan as well as regular updates on the Great Shelford fun run, the Cambridge South development , news about MP Heidi Allen, updates on the Arthur Rank hospice and information about Pink Floyd playing in Great Shelford. Here's an old photo of the former gelatine factory in Great Shelford. See other old photos of Great Shelford. Stapleford Parish Council is growing to 11 councillors. Barkers the butchers in High Street are now selling fresh fruit and veg. This is a welcome addition to the village which lost Tony's fruit and veg shop in the 'tin shed' in Woollards Lane when School Court was developed. The Shelford Deli then took it on but stopped doing it when they changed to a cafe last last year. John Wakefield..
"In the past month, when walking the footpath from Church Street to Hauxton, after dark, I have twice seen a pair of otters in the fields beside the river. They were caught in my torch beam, and stood staring back for a minute or so." Nick Humphrey. An abandoned Kymo 49cc motor scooter registration number LJ59BVS has been left abandoned near the cycle path in Chaston Road. The vehicle has some damage and may have been stolen, according to DVSA records it has not been taxed since 1st August 2015. John Wakefield. An inconsiderate motorist (apparently a Great Shelford resident) caused chaos on Dec 19 by double parking in Leeway Avenue whilst they commuted by train. Large vehicles including this lorry were unable to get by so had to abort deliveries. Cambs. Police were notified but refused to take any action, saying that parking was 'no longer their problem". John Wakefield. This old photo of Hinton Way from around 1917 was sold in 2018 on Ebay. There are lots of other old postcards in a special gallery. A dog owner wants a need dog bin in the village. Woollards Lane, June 27.. Same old problems, two way traffic causing chaos and tail backs to the traffic lights at freestones. ONE WAY PLEASE. Ian Mcleod. 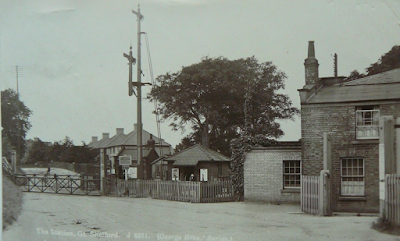 This lovely postcard of Great Shelford station was sold on eBay for £25. You can see other old photos of the village here. This photo of George Bros tobacconists and florists when Woollards Lane was known as Station Road was sold on Ebay. Great Shelford Online has lots of other old photos of the village. Zara in Great Shelford won 2 awards at the Euro Asia curry awards that took place in London in November - Best Restaurant in Cambridgeshire (2nd Year Running) and The Chef of the year 2017. (External link). In the finals of the British Curry awards 2017 (“the curry oscars”) Zara was one of the runners up for best spice restaurant in the Midlands - the only Cambridgeshire restaurant to achieve this in 2017. How Hard Can It Be, the new book by Great Shelford writer Allison Pearson was published in September 2017. 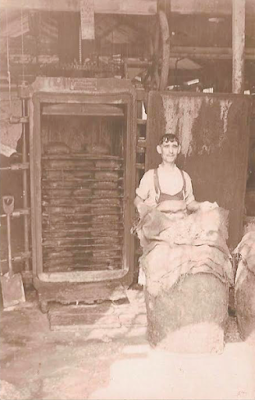 Dozens of old photos of Great Shelford can now be seen together on this Great Shelford website. Sunset on the new Arthur Rank Hospice at Shelford Bottom on Jan 18 2017. Here's one of dozens of old photos of Great Shelford from the past century shared by Mary King. James Newman has spent 4 years and £40,000 building a giant computer inside his Great Shelford home which has made headlines from the BBC to the Daily Mail. The mystery of a house that was due to be re-built in Shelford 50 years ago has re-emerged. 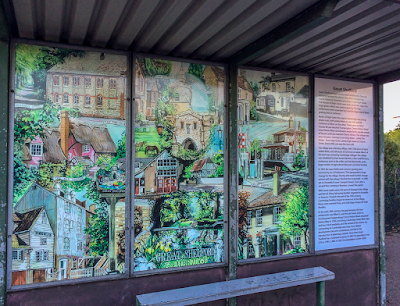 The railway crossing shelter has been improved with a set of local murals by artist Frances Richardson. 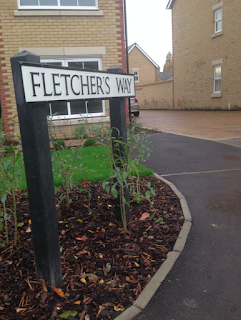 Great Shelford's newest road - “Fletcher’s Way” - is now open. The Parish Council made the suggestion because Leopold (known as Tom) Fletcher’s business, Fletcher and Sons, occupied the site prior to Welch. He ran the business with his sons Leopold junior and Charlie, was well known in Shelford and lived to a great age. On the left is an old photo showing one of his trucks outside the Fletcher & Sons depot. See more photos of the original Fletchers site. 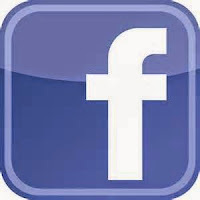 Great Shelford Online has a dedicated section on Facebook, where new stories will be posted. An early version of rock legends Pink Floyd played two concerts in Great Shelford in the 1960s. A fascinating book about the history of Great and Little Shelford has been republished - and you have a chance to buy your own copy. It would make a great Christmas present for history lovers. The number of people living in Great Shelford has grown to 4233 according to the 2011 Census. Considerable efforts are made to ensure the accuracy of all information and adverts shown on the Great Shelford website at www.greatshelford.info. All information is believed to be correct at the time of publishing. However no responsibility or liability whatsoever can be accepted from any consequence of acting on advice or instructions given or inferred. All information on the website is subject to change at any time without notice. Any logos or trademarks displayed on the website are the rights and property of their respective owners. All information on the website and text is copyright of www.greatshelford.info and any reproduction of this without express permission is strictly prohibited. WWW.greatshelford.info and Great Shelford Online is an independent Great Shelford website. David Martin is the editor in chief and the main writer. He was a NCTJ trained journalist before becoming the Managing Editor of BBC Radio Cambridgeshire and the creator of BBC Cambridgeshire Online. Great Shelford is a popular and vibrant village four miles south of Cambridge. 4,233 people live in Great Shelford according to the 2011 Census. Writers Allison Pearson and Adele Geras live in Great Shelford. 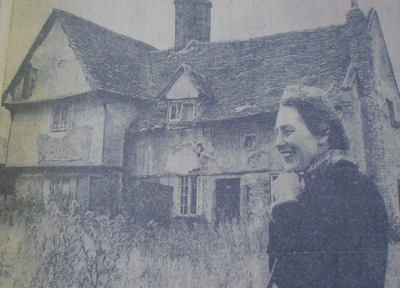 Famous people who have lived in Great Shelford include Julie Deane OBE, founder of the Cambridge Satchel Company, painter John Minton, writers Phillipa Pearce and Tom Sharpe, Sir Peter Hall, the theatrical director and former Arsenal footballer Steve Morrow who also captained Northern Ireland. The Shelford Feast festival takes place every July. Shelford Rugby Club currently play in the National League 2 South. Great Shelford is twinned with Verneuil-en-Halatte in France. The village has links to Pink Floyd. An early version of Pink Floyd played two concerts in Great Shelford. Trinity House at 11 Cambridge Road was the setting for a party which was described in the book " A Pink Floyd fan's Illustrated Guide to Cambridge" as one of "two important Floyd episodes." It was also used for the cover of the Pink Floyd album Ummagumma. 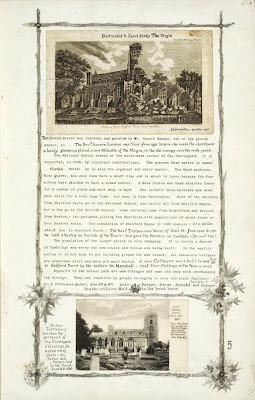 This community website for Shelford, Great Shelford Online, includes details about the Shelford Medical centre, Shelford rugby, Shelford post office, Shelford FC, Shelford football club, Shelford school, the shelford dentist, Shelford primary school, Shelford library, the Shelford calendar, Shelford parish council and details about Shelford history as well as a list of Restaurants in Shelford including Zara, and Forum House, Shelford estate agents including Haart, Tucker Gardner and Sharman Quinney, Shelford businesses including , Shelford Deli, Davies Solicitors, Pipedream plumbing, Shelford dental surgery, Shops in shelford including Shelford deli, Barkers the butchers, Cambridge Cycle Company, Hair solutions Shelford and shelford post office as well as Pubs in shelford including the Plough and Square and Compasses, Builders in shelford, Plumbers in shelford, Shelford churches including Shelford St mary's church, Shelford free church and Shelford community groups including Shelford tennis club, and Shelford WI. The Shelford website also includes details about Shelford events including the Shelford Feast, shelford camping, bed and breakfast and hotel information. There is also a page on Shelford community groups, Shelford planning and the Shelford village plan as well as regular updates on the Shelford fun run, the Cambridge South development , news about MP Heidi Allen, updates on the Shelford hospice, also known as the Arthur Rank hospice and information about pink floyd playing in Shelford. The Great Shelford website includes details about roadworks and burglaries in all the main great Shelford streets including Abberley Wood, Ashen Green, Babraham Road, Birch Trees Road, Bridge Close, Bridge Lane, Buristead Road, Cabbage Moor, Cambridge Road, Chaston Road, Cherry Hinton Road, Cherry Trees, Church Street, Coppice Avenue, Crandal Way, Davey Crescent, De Freville Road, Elm's Avenue, Glebe Lane, Grain Close, Granham's Road, Granhams Close, Granta Terrace, Headley Gardens, High Green, High Street, Hills View, Hinton Way, Hobsons Acre, Kings Mill Lane, Leeway Avenue, London Road, Macaulay Avenue, Marfleet Close, Maris Green, Mill Court, Mingle Lane, More's Meadow, Orchard Road, Peacocks, Poplar Close, Red Hill Close, Red Hill Lane, Robinson Court, Selwyn Close, Shelford Park Avenue, Shelford Road, Spinney Drive, Station Road, Stonehill Road, The Hectare, The Orchards, Tunwells Lane, Tunwells Lane, Walden Way, Walnut Drive, Westfield Road, Wheelers, Woodlands Close, Woodlands Road and Woollards Lane.